I went over a year without buying any new books. I wanted to finish up what I had on my bookshelf. That hiatus is over and I started filling up my shelves again. I’ve been writing book recommendations for a number of years and it’s a post I look forward to writing each year. It’s that time again, folks. Here are my picks for 30 must-read books for 2017! 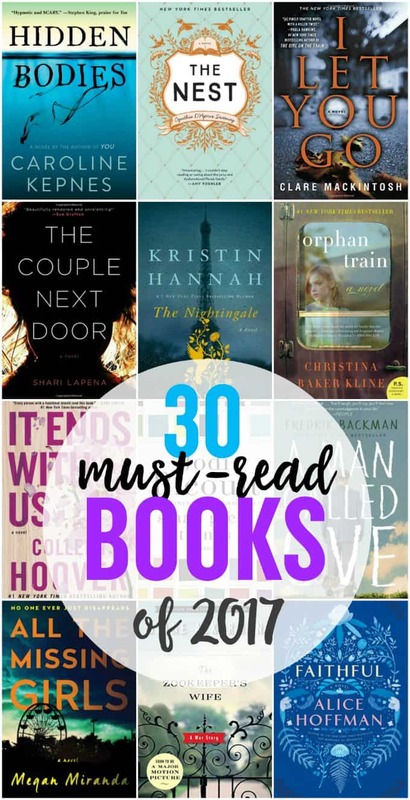 Every year for the past few years, I’ve teamed up with my blogging pal, Crissy at Dear Crissy, to share our top book picks we think everyone should add to their TBR pile. My picks are the odd numbers while Crissy’s are the even ones. I hope these recommendations help you decide what book you should read next! For more book recommendations, check out my lists from 2014, 2015 and 2016. Which books from this list do you want to read in 2017? I would choose The Couple Next Door and What She Knew. The Nest and Moonglow. I really would love to have any of them. The Couple Next Door and Me Before You – I would choose these books. The Couple Next Door by Shari Lapena & Faithful by Alice Hoffman. My wife would like the It Ends With Us by Colleen Hoover and The Nest by by Cynthia D’Aprix Sweeney. The couple next door was really good that is the only book I have read from this list but I wrote a couple down to check out. Currently reading Small Great Things by Jodi Picoult. I would definitely read at least 12 more from here before the year runs out. Thanks for the list. I would pick Small Great Things, and What She Knew.